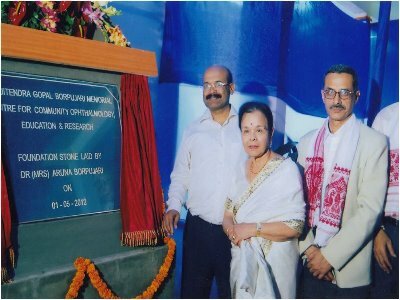 Dr. Jitendra Gopal Borpujari is one of the renowned personalities of Jorhat and Assam. Chandraprabha Eye Hospital is proposed to establish an Ophthalmology centre at Jorhat named “Dr. Jitendra Gopal Borpujari Memorial Centre for Community Ophthalmology, Education and Research” in memory of Dr. Jitendra Gopal Borpujari under PBMT. The purpose of this centre is to improve the eye care scenario of Assam and North East by providing free services like eye care examination, treatment, surgery etc. to the downtrodden people of North East India. Along with cataract the centre will also provide free services for patients of Galucoma, Cornea, Retina etc. Apart from these the centre will also have an Ophthalmology College, a Nursing College, DCB Course, Phaco Training Centre etc. One floor of the centre will be used for Ophthalmic Research. American citizens, Mrs. Aruna Borpuzari, Aradhana Baruah Satin & Robert Satin have provided financial support to PBMT towards construction of the Ophthalmology centre. Donations from well wishers, NGOs and other public & private organizations will be warmly welcomed. All donations are exempted under Income Tax Act 80A..